I can't seem to post my own thread, so I'll have to try here! I've been commissioned to make a coherent map for Topaz, and I've finished the terrain, as far as I can see, and would now like some help with additional locations like caves and forests from this map. Are they all still in the same place? Some of them are marked right next to some of the towns, so are they inside the town, or right outside? You'll notice the other regions are littered with those small green icons, some of which are on top of or inside the city icon, so this information will allow me to put them in the right place. There's also a cropped one of Caldera/Kirant here, in case anyone wants to do any labelling. Also, if there are any changes or alterations anyone wants, please let me know! I have taken a few liberties with the links between the new regions and Hoenn that Zainiadragon provided me with, but otherwise I have been as faithful as possible to the existing maps. - What is that in the left half of the map, past C/K? Is that a sideways Hoenn? - Could you maybe make a more detailed, up close version of just the C/K area? That would help clarify which cities and routes are going to be in the game upon release, and which aren't. 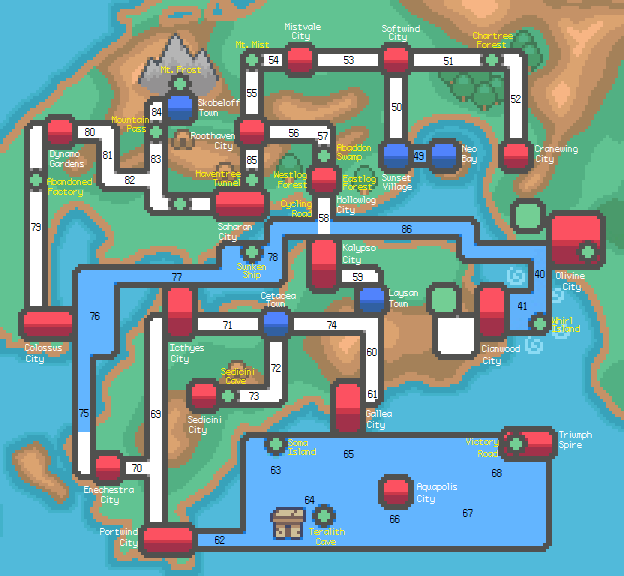 - As for the labels, perhaps you should wait, at least until we decide if we plan to use the Routes we have already there, or if we plan to continue from where Jhoto/Kanto left off at Route 48, i think. - In terms of the caves and other side areas of the game, there have been some changes, such as city names, and some areas have been removed, but You'd have to search/ask the administration of all the changes. - One thing I know for sure is that Frost Town is now Skobeloff Town. - As of now, Olivine and Cianwood are cut off from the rest of Jhoto. And that's all I really have to say at the moment. More detailed? How do you mean? I linked to this cropped version in my post. Is that what you mean? I don't know which ones are meant to be included; I was just commissioned to make this with them all together. I wasn't planning on labelling any routes at this point. I just meant that if someone else wanted to label forests and things on a new map for me that there was a smaller version for that. Will they see this thread? City names are not important, but areas/cities being removed is something that I would need to know about, yes. I did notice they were on their own on the map, but I thought this was simply stylistic. Thanks for commenting, though! I'm not sure of my way around here (as you can tell, I'm sure), so if there's a better place to put this, please point me in that direction. 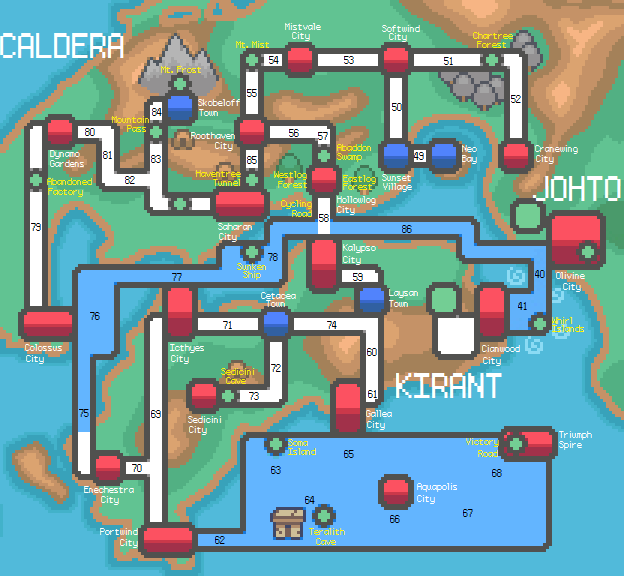 I commissioned the map, and it is my idea about connecting Caldera/Kirant to Hoenn and Johto, obviously, there is no way we will be able to do this until after we complete the original game. Hoenn connects sideways because it is based on Kyushu Island in Japan, as shown here: http://bulbapedia.bulbagarden.net/wi...real-world.png and on NikNak's PokeJapan map here: http://niknaks93.deviantart.com/art/...on-3-188356539. 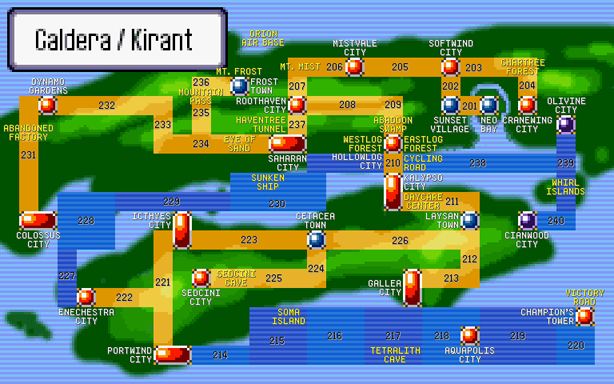 I created the connections leading from Caldera/Kirant leading to Hoenn, so that the route names would lead to 100, if you continued Caldera/Kirant's Route names from Johto's. Why is a new map neccessary? I really liked the style from RSE and FRLG. The HGSS style is nice, but looks a little too simple. 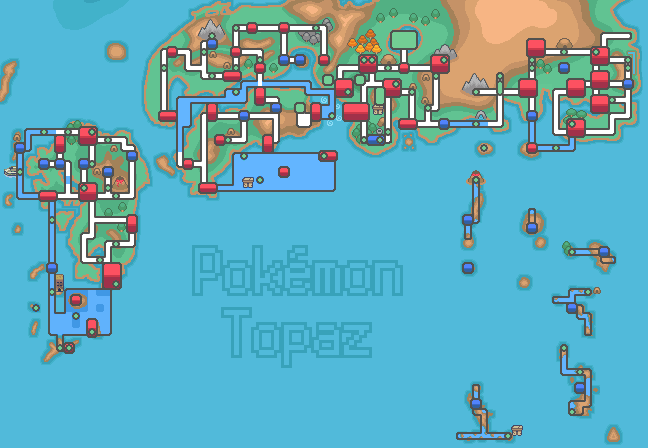 This map does look good, but a this point we don't need the attachment to the rest of Johto/Kanto, and we definitely aren't incorporating Hoenn any time soon. 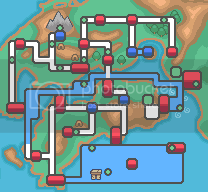 If other people like the style, we could use it, but I think that we'd have to use a version without the routes to Hoenn and Johto in the beginning. Will they see this thread? The commission was for one in this style and one in an RSE style like the original one as well. This was easier, having already made PokéJapan, so that's why this one's appearing first. However, speaking as someone who essentially only makes these, the one on the site is blurry and in need of a revamp, which I am more than happy to provide! I do need some more information about which routes and areas are to be included, though. The connection to the other regions seems to be a bit "pie in the sky" so to speak, but I'm not sure which parts are changes to the original that have been already decided and which are entirely new. These are already decided (but some names have changed). Other than that, nothing is confirmed. So there are no changes to that map? 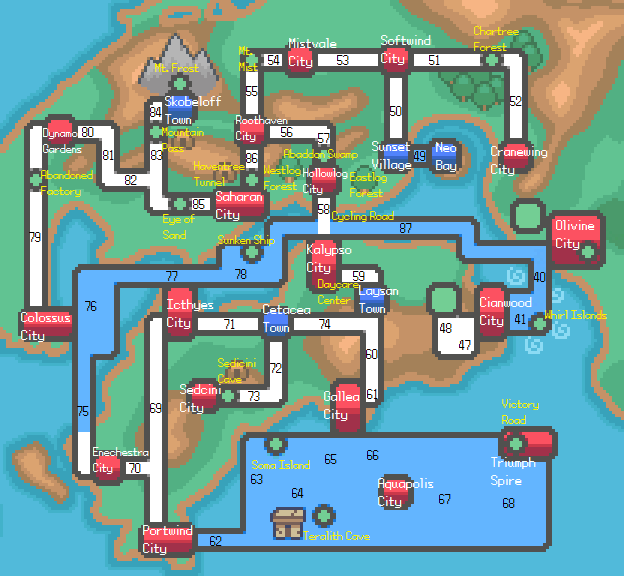 And the Johto routes/cities that aren't shown are omitted, too? Yes. At least, they are omitted for the time being. The only Johto cities (in the initial release) will be Olivine and Cianwood. We are leaving it open for possible expansions in the future, but we'll have to discuss that in depth once the game is actually released. The new map looks really epic, I'll admit. If you could size up the Caldera/Kirant portion and crop it off nicely from the other regions (except Olivine/Cianwood) I'd have no problem using it in the actual game (of course though it's up to everyone). I'm always a sucker for polished looking content, so great job! It looks amazing. How's this? Anything out of place? Anything missing? Can we use this map?!?!?! Haha! Now that's what I'm talking about! That is amazing, I love polished things too! That would look perfect inside the game! Double-sized? Doesn't Essential halve the graphics in-game so it looks normal-sized? No, they need to double it to make the screen big enough to see. I believe the screen size is 480x320, but that may have changed. Oh, so you're not running it at 240x160? Ideally you'd want to increase the size of the screen while keeping the graphics normal-sized. I believe that's possible with RGSS. I don't understand how that would work. Somewhere along the line, the graphics would need to increase in size, and RPG maker doesn't handle that (unless Essentials added that to the script, but I can't find anything to suggest that). It's kind of hard to explain if you haven't seen it. In essence, you just make more of the map visible on the screen instead of just blowing up the graphics. I can show you a mockup if needs be. Well, in any case I know that we had to double the size of the sprites in order to use them. Chartree isn't really all that green. And I noticed some darker blue areas on the (sideways) Hoenn map. Are those the underwater routes? Last edited by Cyndadile; 06-18-12 at 01:04 PM. Yeah essentials does halve the size in game, you're right about that. It was mainly so that we could replace copies of our current region map (which is doubled up just to be more visible and to give more room for text) on the site and such. Now I'm confused. I remember needing to double the graphics size so it's not too small in RPG maker. Is that just the overworlds? Sure, I can make those grey. And, yes, they're dive areas. If you want something similar for the sea routes here, then I'll need some information on the areas where you can dive. I know the city is dive-only, but that's all I've gleaned. Essentially, RMXP is designed to use tiles that are 32x32, which is twice the size of Pokémon tiles, which are 16x16. Essentials compensates by using graphics which are twice the size, and then halving them in the engine itself, so that the graphics are the right size, but maintaining workable tiles. If that makes any sense whatsoever. Sorry, I was gone so long. The island next to Enechresta City is The ENechresta Gardens, a place I made up. Map is 3x normal size, because it seemed like an appropriate size and it allowed for readable text. I changed to the new Route system, but I have a version without the routes if it needs to be changed. Routes 63-68 look like they were just thrown on the map at random. The route labled 85 is an entirely new one. On the original map, it was connected to what is now Route 82, but there is a bend in the road that makes that look like nonsense. I didn't put "Orion Air Base" on the map because I have no idea if that's even still in the game. It doesn't sound familiar at all. Some other information, because I remember we were trying to figure it out when we wanted to change Frost Town and Champion's Tower on the old map: Labels written in "Power Red and Green" font, size 10 for all the yellow and black text, 11 for the Towns (except for Roothaven, Hollowlog, Enechestra, and Dynamo, which are 10). Is it possible for you to make the font 8 pt, reduce the spacing between lines, and move the text off of the cities? Also Route 85 poses a bit of a problem, since 83 is snowy and 82 is deserty and 85 was supposed to be a melding place for the two (so it has both Iglonia and Torkoal, for instance). The way it is doesn't make much sense any more. Maybe if we moved the Eye of Sand so that it lined up directly next to Saharan? We could try making 81 a bit longer and moving down 82 to fit with 85 again. Initially 82 and 85 were the same, so we could do that again. If 82 and 85 attached, we could still have a pure desert route between Saharan and the Eye of Sand. Or the Eye of Sand could be the only purely sandy place. Also, I'd like to work something out for 63-68. The Hoenn map (where all region are combined) has that darker blue. The Route around Aquapolis is a diving area, so it could use the darker blue. Then we could make 64 into a diving Route. We might be able to combine 67 and 68 by moving Triumph Spire closer. 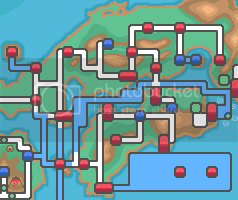 Do we really need two huge routes between the pokemon league and the closest town? Especially since there's victory road, too? Once we decide on those issues, I'll redo the labels. Do we really need two huge routes between the pokemon league and the closest town? Especially since there's victory road, too? Why not? At this point everyone will have gotten HM[Fly] so it's not like the routes make healing hard, just travelling there intially. Can they fly to Triumph Spire yet, or is there no place to land until you pass victory road? I thought they'd have to surf to the island once they got all 12 badges. If we're following the other games (IIRC) the player can fly to Victory Road once (s)he reaches it. So they'd have to reach it once, but then they could fly there. Routes 67 and 68 will entirely depend on what's in them. For instance, if 67 is full of strong currents like near Pacifidlog then it makes sense to distinguish that part from the upcoming 68, and it'll probably be easy to run through that route anyway. Additionally, islands and dive spots can change the whole place. Ok. Are there any other issues to address before I redo the labels? Power Red and Green, 8 pt, off towns. It is an improvement, I think. EDIT: That should be "Whirl Islands". Easy to fix. Route 49 is now land, Chartree forest is now charred, multiple Islands are now whirled. All previous edits to C/K, and routes to Hoenn removed. The flat area to the northwest looks a bit boring, I might try to remove that giant open space. If we do add these to the site, we should also keep the current detailed map up, since the Route numbers will be more familiar to current/returning members. Last edited by Cyndadile; 07-19-12 at 01:32 AM. Okay, I can put these up on the site, though the old map is probably going to stay for the clickable links and names. It'd take a load of work to get this map to work with that.